Atrial fibrillation (AF) is the most common cardiac dysrrhythmia. The evidence base and expert consensus opinion for management have been summarised in several international guidelines. Recent studies suggest a disparity between contemporary practice and perceived best practice. An electronic questionnaire was constructed to capture details of patient demographics and current practice, including risk assessment for stroke and major bleeding. All patients >18 years with AF as a primary or secondary diagnosis admitted from midday on the 14th September 2011 to midday on the 15th September 2011, were included in the survey. Participating units were recruited from the Society for Acute Medicine registry, and provided with an electronic link and password to enter data for individual patient episodes. The electronic questionnaire was completed for 149 patient episodes from 31 acute medical units (AMUs) across the UK. The typical patient with AF presenting to the AMU is older, has important medical comorbidities (sepsis in almost a third) and frequently presents out of hours. Initial management was digoxin alone in 22% and 23% had a documented stroke risk assessment, not in-keeping with current guidelines. This relatively simple methodology yields valuable insight into the real world management of AF, providing an additional evidence base. The effective management of AF has been a source of recurring debate, leading to the publication of combined American College of Cardiology/American Heart Association/European Society of Cardiology (ACC/AHA/ESC), and National Institute for Health and Clinical Excellence (NICE) guidelines in 2006.7,8 In addition to evidence-based strategies for rhythm and rate control, an important issue addressed in these guidelines was that of thrombotic risk assessment and management. This was further prioritised in the 2010 ESC document.9 Recent studies have suggested that both primary10 and secondary11 care may not follow guidelines for the management of AF. point of assessment and care for the majority of medical inpatients. Hospital episode statistic data suggest that, of the 5,287,032 emergency admissions in England from 1st April 2010 to 30th March 2011, 57,898 (1.1%) had a primary diagnosis of AF. The number of AMUs affiliated with the Society of Acute Medicine (SAM) has steadily increased since its inception in the millennium, and now stands at 220.12 These units serve a substantive UK population base, creating considerable potential for collaborative research into current medical practice. The Acute Medical Research Network of SAM, in association with the National Institute for Health Research Collaboration for Leadership in Applied Health Research and Care (NIHR CLAHRC) for Northwest London, commissioned a survey to examine contemporary management of AF within AMUs in the UK. We report the findings of this survey and its implications. An electronic questionnaire was constructed with fields including risk assessment for stroke and major bleeding, citing widely used scoring systems (see Appendix 1). All patients >18 years with AF as a primary or secondary diagnosis admitted over a specific 24-hour time period (midday on 14th September to midday on 15th September 2011) were included in the survey. Participating AMUs were provided with a link and password to enter data for each patient episode into the survey. Units were advised to nominate an individual to coordinate participation at a local level to prevent duplication of data entry. Of the 220 AMUs initially canvassed, 31 eventually provided patient data, representing a population base of more than seven and a half million adult UK residents (figure 1). The electronic questionnaire was completed for 149 patients (table 1). The symptom profile and AF status of the patients is displayed in table 2. Sepsis was the principal associated diagnosis present in almost a third, followed by heart failure and cerebrovascular events (figure 2). The hierarchy of associated diagnoses was different for the elderly, where cerebrovascular events ranked highest, together with sepsis and heart failure accounting for 70% of presentations (figure 3). In line with NICE guidelines, all patients received a resting 12-lead electrocardiogram (ECG). Abnormal QRS morphology, predominantly left bundle branch block, was noted in 17%, and repolarisation changes were seen in 13% (table 3). Less than a quarter of the study population (23%) had any form of stroke risk assessment (NICE, CHADS2, CHA2DS2-Vasc) (Appendix 2). Retrospective CHA2DS2-Vasc scores for those who were not risk stratified averaged 3.5, and the mean age of this subgroup was 77 years. Of note, 73 (80%) patients with a significant risk for thromboembolic stroke (retrospective CHA2DS2-Vasc score >2) were not prescribed anticoagulation therapy at time of discharge. The risk of stroke needs to be balanced with the risk of major haemorrhage. Despite this, only 36% (n=54) of patients with a CHA2DS2-Vasc score >2, had a HAS-BLED score of ≥3 (8.7 major bleeds per 100 patient-years). In addition, 24% (n=15) of patients at risk of major haemorrhage (HAS-BLED score of ≥3) were discharged on anticoagulation therapy. Four of this group were concomitantly discharged on antiplatelet therapy. Rate control was the principal form of initial management, but one in five patients received digoxin alone (table 4). At the time of data collection, information was available for 99 discharged patients (table 5). One in five was offered inpatient or outpatient cardiology review and most were prescribed rate-limiting medication. Half were discharged on aspirin or clopidogrel, and a quarter on warfarin, with the remainder receiving neither an antiplatelet nor an antithrombotic agent. In total, 49 (33%) of patients presented out of normal working hours (defined as from 6.30 p.m. to 8.00 a.m. on weekdays, the whole of weekends, bank holidays and public holidays).13 Documentation of stroke risk was performed less frequently in patients who presented with AF out of hours, though this was not statistically significant (18.4% vs. 27.2%; Fishers exact p=0.29). 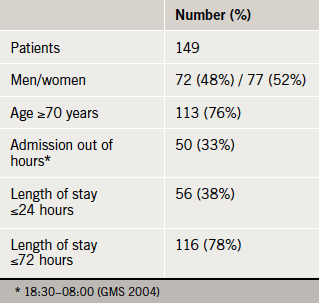 Patients who presented with AF out of hours tended not to be discharged within 24 hours (28.6% of patients presenting out of hours vs. 45.7% of patients during normal working hours; Fishers exact p=0.06). There is no existing database that fulfils all these parameters. Clinical audits and registries have been successfully used to drive quality improvement. Routinely collected data (e.g. hospital episode statistics [HES]) have been used to explore trends in patient outcome. It is estimated that the average cost of running a national clinical audit is £250,000 per year. These audits have reasonably lengthy duration of set up, data collection and analysis, with consequent delay in feedback to participating Trusts. Poor coding practices have also given rise to doubt as to the accuracy of HES data. We describe the piloting of an electronic survey driven, in part, by the expanding infrastructure of SAM. Our survey was designed to incur low cost and be quick to administer, facilitating rapid data analysis and feedback to participants. Additionally, the methodology allows for ease of replication, allowing time series data to be captured following local improvements. Two thirds of AMUs approached did not express interest in participation, and the eventual contribution rate was low at 14% of the total, but nonetheless, the population base accessed was considerable. We suggest that this model, readily adaptable to different conditions and presentations, has powerful potential as a research tool in acute medical practice. Our survey suggests that the current management of individuals with AF in the acute medical environment is falling short of national standards7-9 in a number of areas (see Appendix 3). Reasons for recalcitrance in antithrombotic therapy in the elderly (who paradoxically are at higher risk of thromboembolic events) stem from safety concerns relating to the risk of falls and major bleeding.17 Several large randomised-controlled trials18,19 have confirmed the efficacy and safety of antithrombotic therapy in this population. The recent systematic review and health economics model of Hughes et al.20 demonstrated that stroke risk stratification models were able to discriminate between different categories of stroke risk (at least 95% confidence interval), and that anticoagulation of high-risk patients was cost-effective. Balancing the risk of stroke in AF with that of major bleeding, Pisters et al.21 have devised a novel bleeding risk score (see Appendix 4), which was validated by Lip et al.22 on a large patient cohort from the Stroke Prevention Using an Oral Thrombin Inhibitor in Atrial Fibrillation (SPORTIF) III and V trials. Third, digoxin was the first choice for rate control. Rate control with digoxin is as effective as beta blockers or calcium channel blockers for control of ventricular rate at rest. Beta23 and calcium channel blockers,24 however, have the added advantage of providing effective rate control in exertion (hyperadrenergic state).7,25 In addition, beta blockers have proven efficacy if the patient suffers from concomitant ischaemic heart disease, and diltiazem has been shown to be superior to digoxin in acute AF.26 It is also important to note that while rate control in permanent AF provides alleviation of symptoms, it does not reduce thromboembolic risk. Fourth, although not expressly stated in the guidelines, but recommended by inference, four out of five patients did not receive a cardiology opinion. EuroHeart, a large scale study (n=5,333) of ambulatory and hospitalised patients with AF seen in cardiology centres across 132 countries demonstrated excellent outcomes.27 Of note, a relatively high proportion of this population (34%) underwent cardioversion at enrolment and 94% had an echocardiogram at least once over the course of a year. Where acute medicine could undoubtedly improve is in the assessment of thromboembolic risk, particularly with the availability of CHA2DS2-Vasc, a rapid user-friendly scoring system with prognostic power. This said, taking the time to assess risk and translate this to treatment may be challenging in high intensity, rapid turnover units. We recognise that this study design has a number of limitations. It is a measurement at a single point of time, with little facility to compensate for variation. It consists of self-reported data, with no ability for external validation. The need to distinguish zero admissions from non-participation became evident at the end of the pilot, as did the need for contextual data (e.g. size of AMU). The dataset is rich with clinical information and process measures, but the design makes clinical outcome measures difficult to measure. Relatively low participation rates limit generalisability of the results. We would like to thank the Society for Acute Medicine for distribution of the electronic survey, all participating units and Dr David Ward, Consultant Physician in Acute Medicine at Queen Elizabeth Hospital, South London Healthcare NHS Trust, for contributing to design of the electronic survey. JS Clinical Research Fellowship is funded by the Royal College of Physicians. AB, DB, DCM: none declared. This article presents independent research commissioned by the National Institute for Health Research (NIHR) under the Collaborations for Leadership in Applied Health Research and Care (CLAHRC) programme for North West London. The views expressed in this publication are those of the author(s) and not necessarily those of the NHS, the NIHR or the Department of Health. Lip GY, Golding DJ, Nazir M, Beevers DG, Child DL, Fletcher RI. A survey of atrial fibrillation in general practice: the West Birmingham Atrial Fibrillation Project. Br J Gen Pract 1997;47:285–9. Loo B, Parnell C, Brook G, Southall E, Mahy I. Atrial fibrillation in a primary care population: how close to NICE guidelines are we? Clin Med 2009;9:219–23. Lim JCES, Suri A, Sornalingham S, Chua TP, Lim J. Audit of management of atrial fibrillation at a district general hospital. Br J Cardiol 2010;17:89–92. Lambourne A, Percival F, Ward D, Laverty AA, Bell D. An evaluation of consultant input into acute medical admissions management in England. Report of: Hospital service patterns versus clinical outcomes in England. London: Royal College of Physicians, 2012. The National Health Service (General Medical Services Contracts) Regulations 2004. 2013. Hobbs FDR, Fitzmaurice D, Mant J et al. A randomised controlled trial and cost-effectiveness study of systematic screening (targeted and total population screening) versus routine practice for the detection of atrial fibrillation in people aged 65 and over. The SAFE study. Health Technol Assess 2005;9:iii–iv, ix–x, 1–74.